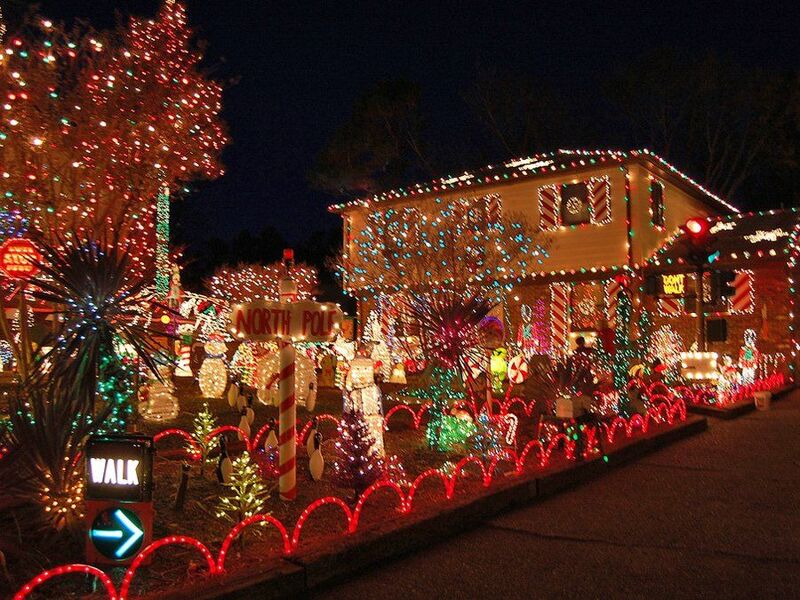 We’ve all driven by the houses with giant inflatable snowmen or animatronic reindeer out front, Santa and his eight tiny reindeer on the roof or strings of pulsating lights reminiscent of Vegas in its heyday festooning the roof’s edge. And we’re jealous, because we live in a condo, and we feel like we don’t get the opportunity to overdo it. But we DO! You just have to know how. Your biggest outlet for decorative creativity in a condo is your balcony. Most balconies are pretty small, but that’s what’s so great about them — they’re like life-sized dioramas, putty in your inspired hands. Set up a nativity scene. Even if you’re not particularly religious, the small balcony space cries out for such a setup.Large, lawn-sized figures will run you a few bucks, so if you’re down with this idea but can’t afford the entire menagerie, start small with the just the nuclear family — Jesus, Mary and Joseph. Next year, add a wise man. The next year, a couple of sheep. If you have a really good year, maybe a camel and a donkey. Some of these sets are three dimensional, others only two. Some are plastic, some wire mesh. Even if you don’t get the kind that lights up, you’ll want some type of lighting to illuminate your scene, so if you don’t have an electrical outlet on your balcony, plan how to snake an extension cord into your unit. Put up a tree. It’s always fun to set up two Christmas trees — you can give each of them a different theme. But what’s really great about this idea is that if you have a new puppy or a cat that likes to climb your tree, you can decorate it however you want and put it out on the balcony. Enjoy its beauty day and night without worrying if your pet is urinating on it or otherwise trying to destroy it.This is also a good idea for neatniks who hate the dreaded needles that fall to the floor each day and need to be vacuumed up. Decorate tastefully with wreaths and garlands. If you subscribe to Southern Living, or if you live in Georgetown, the above ideas won’t fly. 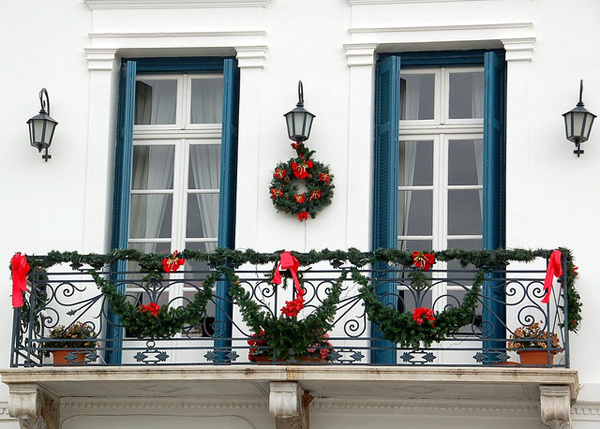 There might even be local ordinances forbidding anything visibly plastic.That’s OK. You can show your Christmas spirit by wrapping a subtle green garland studded with holly berries around the railing. Add an evergreen wreath decorated with a big bow and some pine cones, and you’re good to celebrate without offending. Go blue and white for Hanukkah. Hanukkah starts on Dec. 24 this year, so this year celebrants can have more unity with their festivities.We won’t lie — outdoor menorahs can be expensive. Plus, their shape makes them particularly prone to being lifted by the wind and turned into a projectile, so if you use one on your balcony, be sure to anchor it to the railing. Otherwise, consider weaving blue and white lights through the rails, or arranging them in the shape of a Jewish star. Happy Hanukkah banners and flags emblazoned with menorahs can be found online, or check your local Judaica store. Hang a Kwanzaa flag. You won’t find a whole lot of plastic, inflatable or illuminated Kwanzaa decorations for sale. In fact, the market for any Kwanzaa decorations is small, comparatively speaking.However, many beautiful flags and banners can be found for sale online, and these are easy to attach to a balcony’s railing. Green and red lights are certainly simple to find right now, so you can supplement your flag with some festive lighting as well. Have any fun decorating ideas to add for condo balconies? Add them in the comments section!